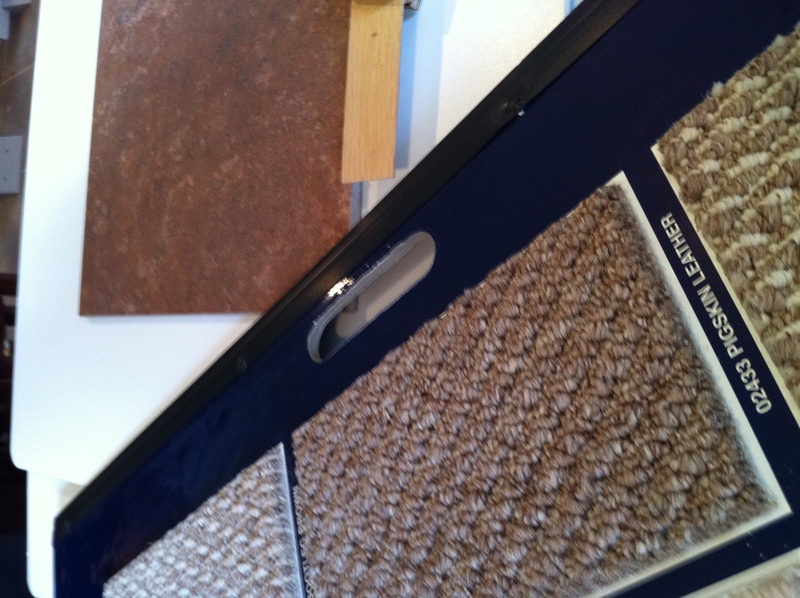 On Saturday, we spent all afternoon at the new house picking out finishes. So far the structure of the house is complete. 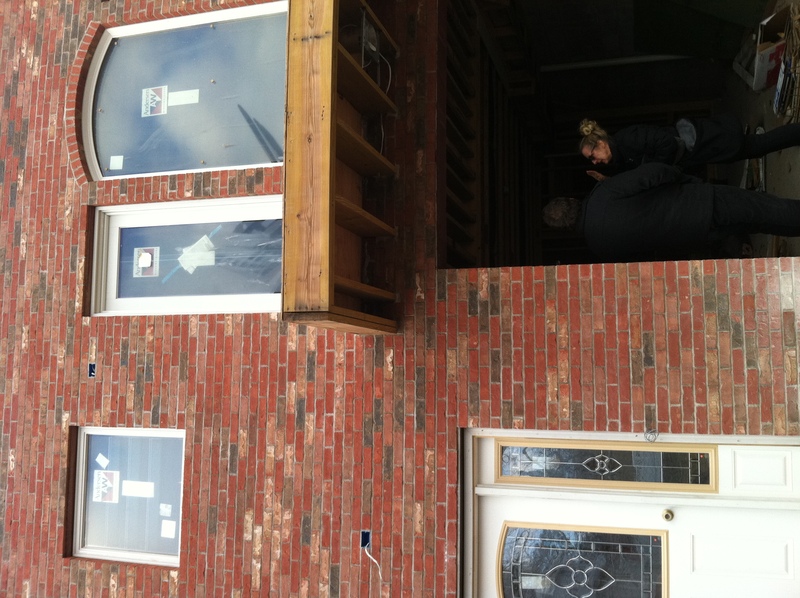 We were excited to see that the brick and siding had gone up. 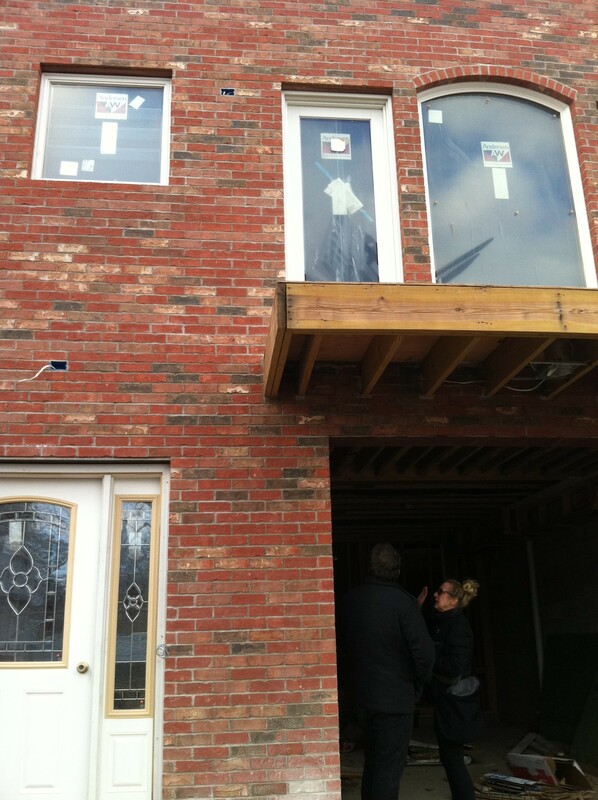 That’s Mike and our real estate agent, Laurel, checking out our garage. 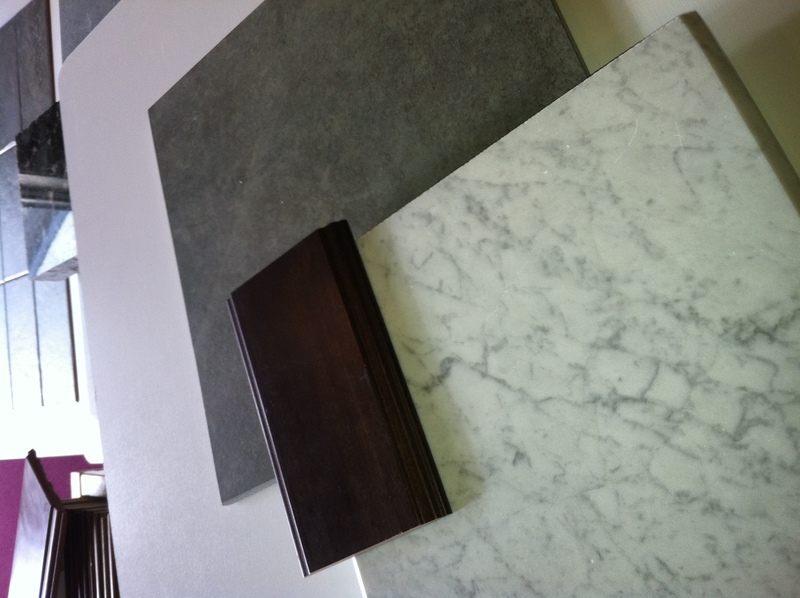 The builder offers a pretty nice set of standard finish options, but of course I still could not decide on tile and marble for the master bathroom. 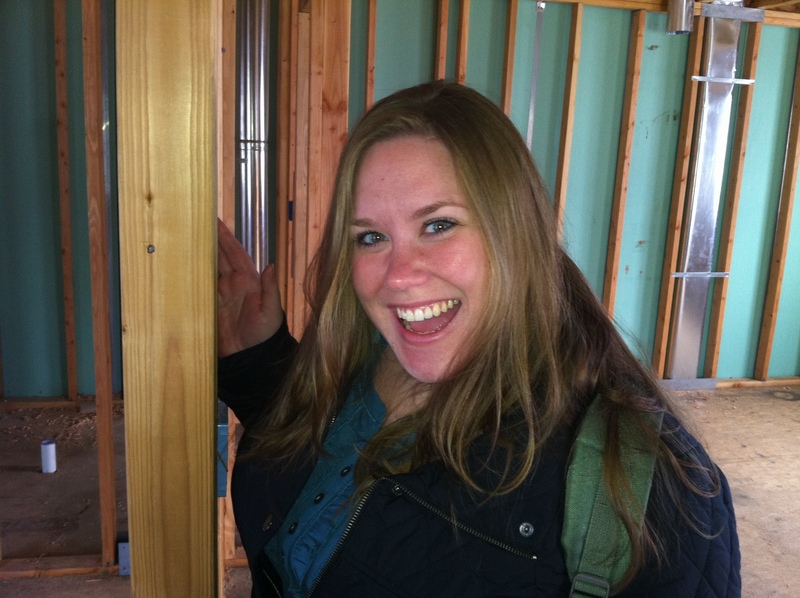 We did chose the tile for the kitchen, two half baths, and downstairs entryway. You can’t tell from the terrible iPhone photos, but the large floor tile is a gray, almost slate color. Its called Concrete and I love it. The tiles are extra large, so we are hoping that the kitchen floor will almost look like one large piece. The smaller tiles are for the kitchen back splash. They have some nice green and brown tones that really compliment the Green Butterfly granite. We couldn’t quite find the cabinet color that we liked, but I think we are going to go with an espresso stain with a black glaze. Hopefully it will look like a mix of what you see above. I really hope that it won’t be too dark. We’ve asked the builder if he can provide a lighter granite, if not we’ll just have to live with it! We wanted the half bath on the main level to tie in with the kitchen color scheme, so we chose this green/gray tile which looked beautiful with the white Carrera marble. We went with a simple deep brown cabinet, which should contrast nicley with the light marble. You enter the house on the ground level, which is almost like the basement level. 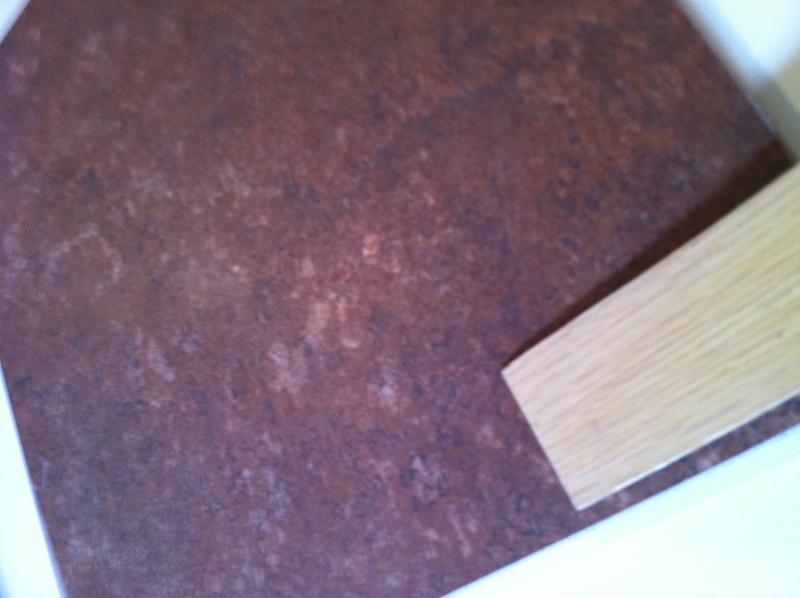 For the entryway Mike picked out this reddish brown tile. It is certainly dramatic. We also decided to go with natural hardwood throughout the house. We tend to pick out darker furniture, so we thought a light colored floor would work well. The first time you’ll see hardwood is on the stairs in the entryway. The reddish tile in the entryway will lead into the family room, which is the only carpeted room in the house. Mike can’t wait to claim this room for his instruments, video games, comic books, and sports paraphernalia. We thought the name of the carpet was fitting for a man cave. 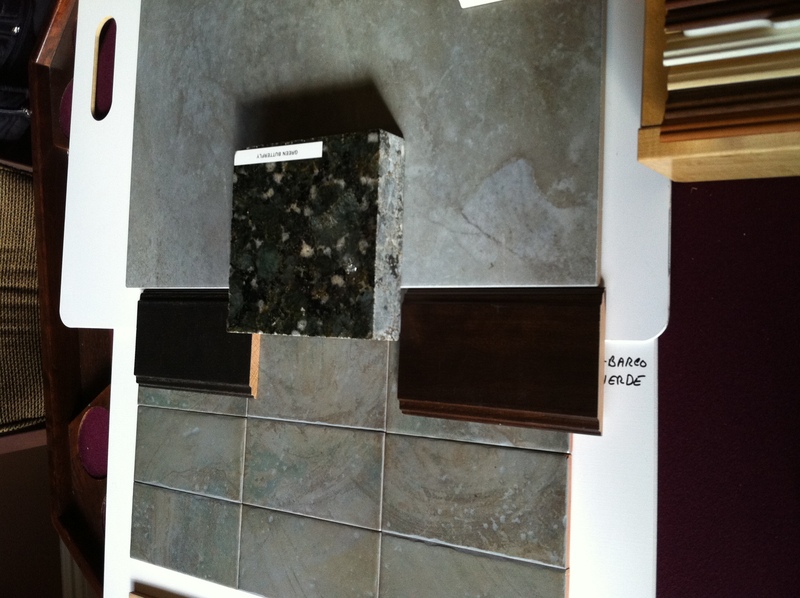 We also picked out the marble and tile for the basement half bath, but I didn’t get any decent pictures. Hopefully next time I’ll remember to bring my good camera. This entry was posted in Interior Finishes, Uncategorized and tagged Carrera marble, entryway, Green Butterfly granite, half bath, kitchen, man cave. Bookmark the permalink.